It was hard to leave Ulaanbaatar. Our winter break had been good in many ways. We had created a nice social life, gotten to know quite a few really nice people, established bonds with Mongolians and with projects going on in Ulaanbaatar. But it was time to go and we were cycling the Gobi, a desert with surprises! 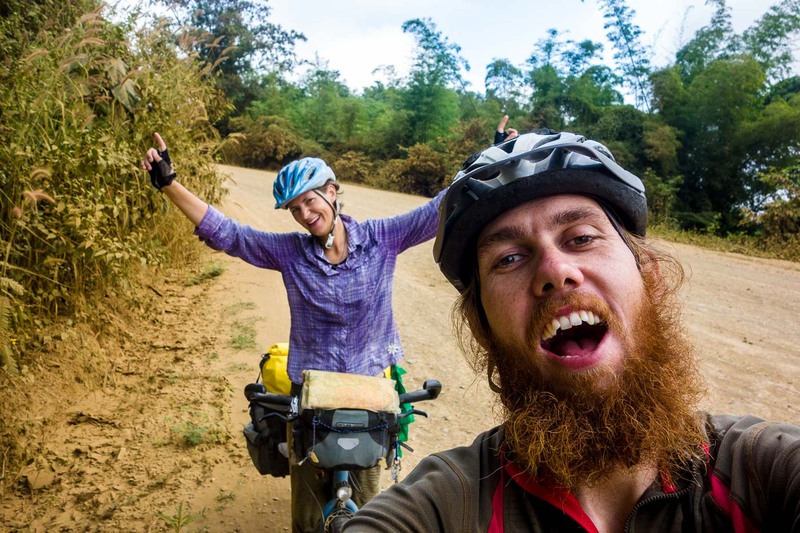 Our goals of cycling were tugging on us to make a move on and we were ready to leave the city life behind us and get back in the routine of being on the road and being outdoor. Luckily Ulaanbaatar gave us a nice surprise by raising the temperature on the day of the departure so we had a nice 15 degrees to cycle in. Welcome spring! We were waved off by our housemate Richard and a couchsurfer Claire who was staying at our apartment. MG, our other housemate had left us some souvenirs because she couldn’t be there to say goodbye (including the book: Hearing Birds Fly by Louisa Waugh, a good read about Mongolian nomadic life). Nyam, a Mongolian friend we had made in Ulaanbaatar and who has cycled in Germany and South East Asia would accompany us out of the city. It was 11 by the time we finally left. We headed south towards the river and slowly made our way out of the city on the narrow road against a nice and firm head wind. Already the road was giving us a nice taste of what was to come with rolling hills and going up slowly. It was a beautiful day with the famous blue sky and we were happy to be on the road. After lunch, a quick Buuz in a local shop, we headed out and soon it was time to say goodbye to Nyam. Really nice to ride out together and he has made some nice photos and videos of us along the way. Now it was time to settle in our rhythm and let the road decide. Towards the end of the day we thought it would be good to find a place to sleep. Luckily we passed a sort of Buddhist camp with a few gers. Martin walked in and asked if we could stay. We could and soon they had provided us with tea, cheese and sweets. And also they had heated a fake ger for us where we could spend the night. Very nice! It was a nice and easy start to getting back on the road. In the following days the scenery was how we expected the south of Mongolia and still it is intriguing every time. There is nothing. Absolutely nothing and still if you look good you can see differences all the time. A herd of cows, horses, sheep, a farmer on a horse or a herder on a motorbike. And all of a sudden a train would come rumbling by because most of the route we were following the railroad south. We also saw multiple groups of small animals and have named them the little Gobi deer. In the museum in Sainshand we learned later that these are actually small gazelle. It was nice to see some wildlife on the road. Nowadays the whole road is paved and after a few hundred kilometers the quality of the road was very good. Apparently it is the Millenium road sponsored by the USA. We camped a few times, got visited by a herder on his horse curious what we were doing. We slept in our tent and enjoyed the nothingness. The sky in the night is bright with the moon and many starts. It is just an amazing idea and experience. A sandstorm pushed us to the village Choir, we were going 50 km/hr without pedaling!! Sand was everywhere, a really surreal experience! We were lucky it was a tailwind and we reached Choir a lot earlier than expected although we did 80 km that day. We looked for a local hotel and had a rest. We also had some mechanical issues to deal with these days. In the first days Susanne’s rear tire was losing pressure, so we changed the inner tube, just to be sure. Then when we were on the road suddenly the chain was scraping against the front derailer. We adjusted the cable and then it happened again. Only then we saw that the cable had split and was only still connected with a few ends, but most ends were hanging loose. Luckily we had packed an extra gear cable and Martin was fast to fix this problem at the end of the day when we camped. Again we were in the middle of nowhere and the wind had gone down a bit. We made a good start and cycled 121 km because the road was mellow and the wind was non existent. We had announced this day as the day we would see camels. Because we hadn’t seen them yet while cycling the Gobi. We were pushing through and all of a sudden Martin said: “eeehmmm”. I looked up and they were there (and we couldn’t have missed them but almost did)! A group of thirty or so camels and at least 8 of them were young babies! It was great to finally see them although they were quite far away. It is good we have our monocular to bring them closer. This group is the only group we have seen until Sainshand but we are hoping to see more and closer by! We found a small village where we asked some truck drivers if there was a place to stay. They said not here but in the next village. They gave us some sausages from their van. We asked in a shop and here they pointed us to a building where we could ask for a room. A Mongolian pregnant woman and her young child treated us and let us in. It was very basic but fine for this day. Next door horses were saddled and a man rode of with two young boys, each on there own horse. Their tails were held together. A sign that these horses are being trained for horse races. We had focused on Sainshand to stay for a few days at the Crystal House Hotel. Sainshand is one of these outpost cities with quite a few people but very basic essentials. It was nice to stay here for a few days. We are away from the influences and ideas Ulaanbaatar and it was good for us to align our thoughts. 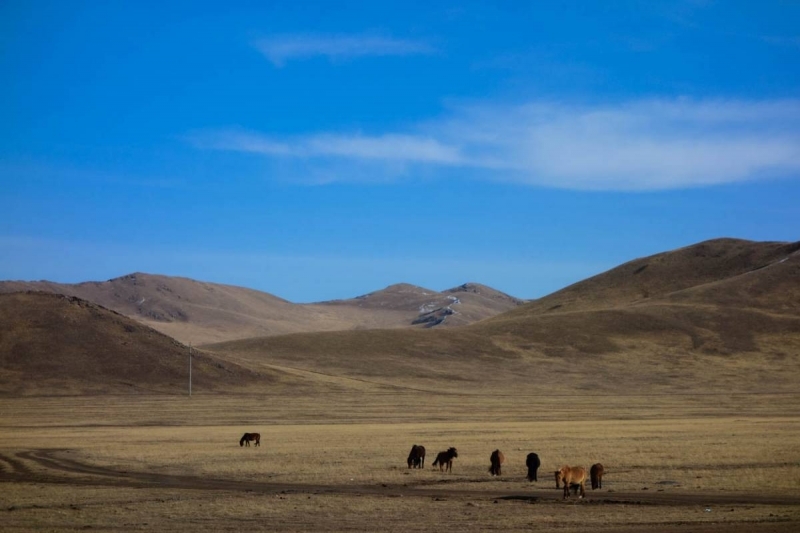 Prepare for the next stretch of our trip and slowly say goodbye to Mongolia. We’re not done with Mongolia yet and definitely will come back one day. Maybe in summer, but maybe also in winter as the winter season is very special and it is possible to see the real tough and harsh Mongolia. The Mongolia that the people here are active in every day. 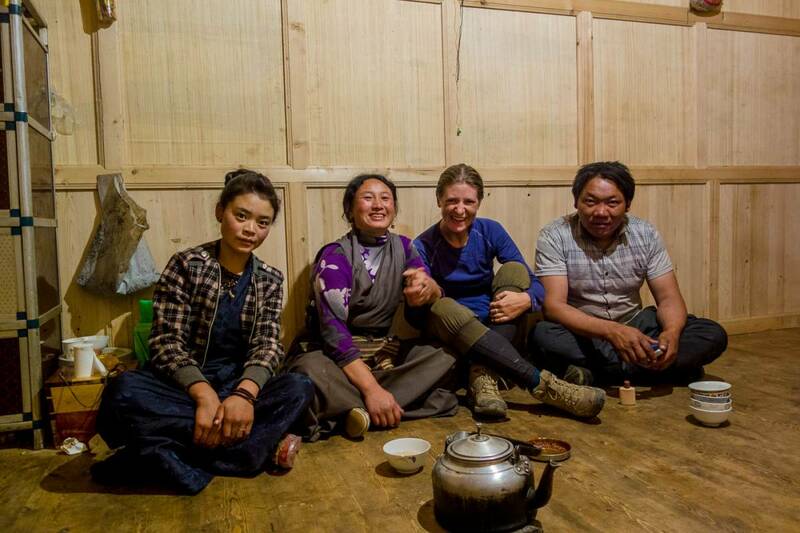 After a few days we got back on the road again towards Zamyn Uud and ultimately China. We had spoken of doing a detour, but the weather looked less inspiring so we decided to go for the border. When we left it looked like the day was clearing up from rain in the night but we couldn’t have been more wrong. Rain fell on us the rest of the day. A truck had stopped just when we cycled out and offered us a lift but we thanked him and cycled off. Maybe that would have been the better decision. Now looking back the day was okay. It is definitely different being in a desert when it rains! We set up camp in the desert off the side of the road in the distance because all the terrain was flat. Hilly but flat. We had seen some horses on the road. They were on the road to drink the rainwater that was falling down and cars were honking at them to move along. Apparently they were quite stubborn because we heard the honking until late that night. We made our way into the tent taking everything we needed and the temperature was dropping slowly to zero and minus degrees. We had talked that it maybe even would be snowing. We woke up the next morning to a beautiful snowy landscape with camels around us. Camels again! They were looking at us thinking: ‘what are you doing here?!’. The snow and sand combined made mud which made it hard to get back to the road and we started cycling in the rain. Soon the day cleared a little bit and in the afternoon also the wind decided to become friends and gave us a push. Welcome back to China. 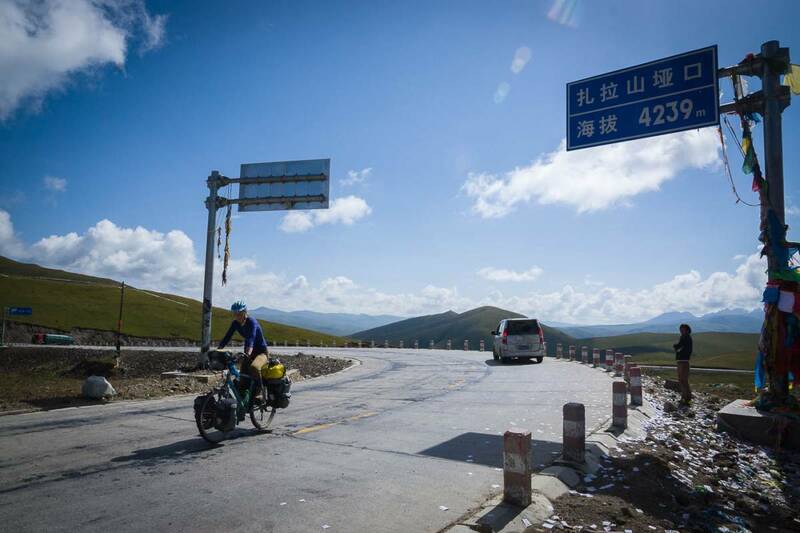 We are sad to say goodbye to Mongolia and excited to be back in China to continue our bicycle journey!